Butterflies of Singapore: Send in the Clowns! One late Saturday morning, ButterflyCircle member Federick Ho took a break from his work and took his photographic gear and went out for a couple of hours of butterfly hunting. 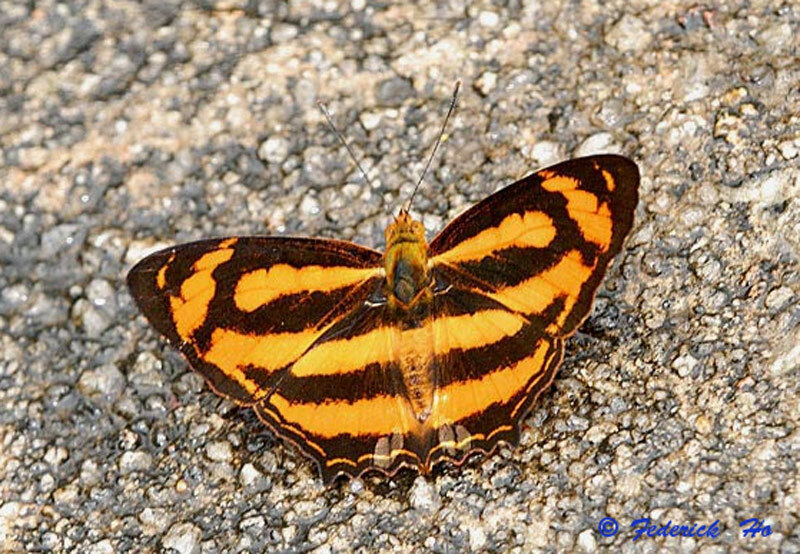 After walking for some distance and shooting the usual butterflies that he encountered, he noticed a black and orange striped butterfly puddling on a concrete driveway. As he approached it, Federick took the usual "insurance" shots from afar. As he moved closer for a better shot, the butterfly took off speedily and headed for the treetops. Assuming that it was either a Lascar or a Colour Sergeant, Federick didn't think much of his record shot and stored his camera equipment as the dark clouds signalled an imminent downpour. Later in the week, when Federick processed his shots, he realised that he had shot something new! Upon closer examination, it was concluded that this was one of the Jester species from the genus Symbrenthia. This sparked off a search for this mystery butterfly the following Saturday, but a whole morning of searching the area where Federick last saw this butterfly was in vain. Glimpses of some black and orange butterfly gliding around were made, but the Jester proved elusive. 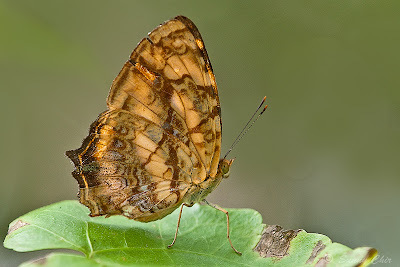 Undeterred, senior ButterflyCircle member Sunny Chir went again the following day to look for it. Based on the knowledge that the Symbrenthia spp were mainly forest species, Sunny decided to hunt in the nearby forested area where the species was last shot. After a long hot trek looking high and low for the butterfly, Sunny spotted a small colony of individuals of the Jester-like butterflies gliding at the treetops. He waited patiently and an individual flew down, and Sunny was able to take a shot of its underside. 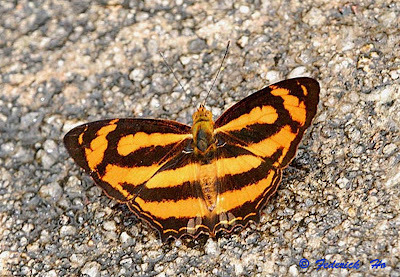 There are four species of the genus Symbrenthia recorded from Malaysia. All the species bear a short pointed tail on the hindwing. The Symbrenthia or Jesters, are black above with orange bands. The undersides are a richly coloured with variegated patterns on a buff or ochreous ground. Initial examinations of the photographs taken by Federick and Sunny indicate that this new discovery for Singapore is most likely a Symbrenthia hippoclus selangorana or referred to by its English Common name, the Common Jester. ButterflyCircle records this officially as species #302 in the Singapore Butterfly Checklist and a new discovery for Singapore. We welcome this new "clown" in town, as the name Jester suggests, to our little island in the sun! It is so lovely, but i wonder why it is called a jester. I somehow thought of a jester with unusual markings like a clown! Beautiful!! I can just imagine leggings on a clown in those colors and pattern. You are actually living with real butterflies, while I in the Northeast United States merely relive and await the return of more life in the landscape.